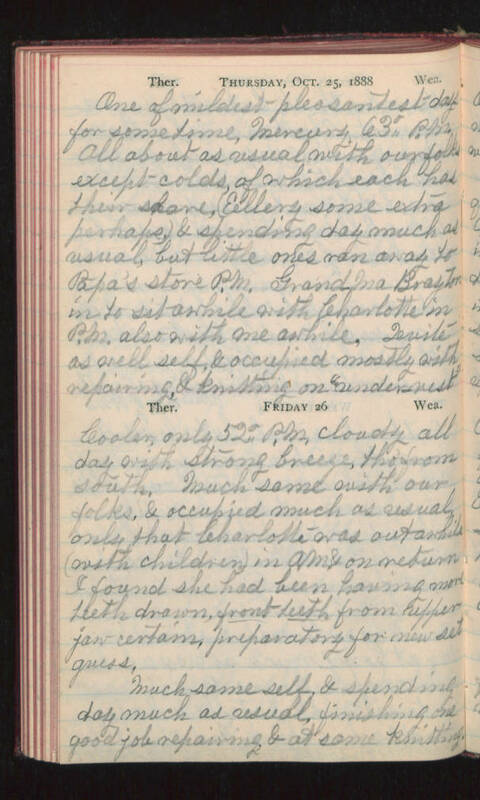 Thursday, Oct. 25, 1888 One of mildest pleasantest day for some time. Mercury 63° P.M. All about as usual with our folks except colds, of which each has their share, (Ellery some extra perhaps,) & spending day much as usual, but little ones ran away to Papa's store P.M. Grand-Ma Brayton in to sit awhile with Charlotte in P.M. also with me awhile. Quite as well self, & occupied mostly with repairing, & knitting on "under vest". Friday 26 Cooler, only 52° P.M. cloudy all day with strong breeze, tho' from south. Much same with our folks, & occupied much as usual, only that Charlotte was out awhile (with children) in A.M. & on return I found she had been having more teeth drawn, front teeth from upper jaw certain, preparatory for new set guess. Much same self, & spending day much as usual, finishing one good job repairing & at same knitting.